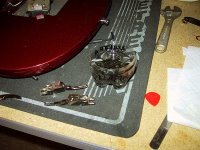 I have now gotten Nik's Ibanez S that he bought on eBay taken apart, as mentioned in my previous entry earlier this month. It was in really bad shape, much worse than I thought. The pickups, apart from sounding horrible, look horrible and we have decided that I will replace them. 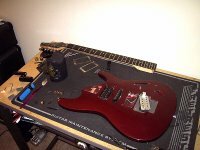 We have some Ibanez V7s and V8s left over from Nik's Ibanez 1570 that I am going to use. Everything else is cleaning up nicely. It should look like a totally different guitar when I am done.